We offer Breakfast, Lunch and Dinner either inside or outside, with a beautiful view where you can watch the wildlife from your table, with friendly staff ready to serve you. With our well trained chefs, it’s our mission to ensure the best quality meals. Our breakfast and dinner would be set out on a buffet style, so each guest can enjoy the food according to their liking. With our beautiful decking and relaxing characteristics, you would want to enjoy the pool all day long. Just a few meters from the pool area is a waterhole for wild animals and you can enjoy their presence from where you are relaxing. 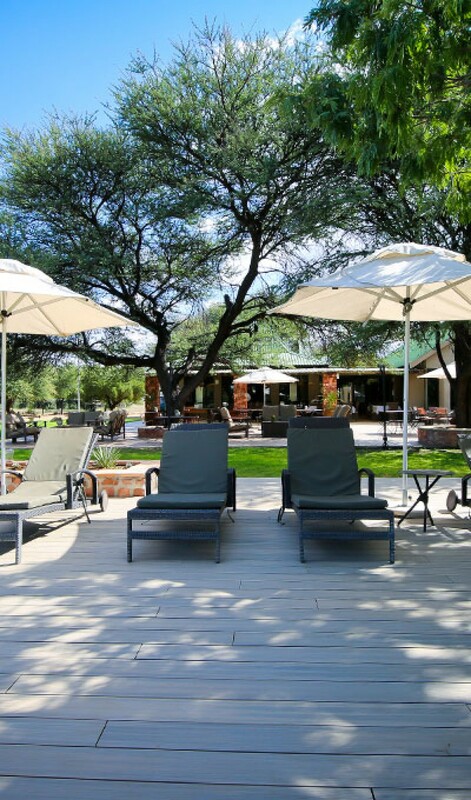 It’s here where you can be served and just relax in the Namibian sun. Children must be supervised by parents or a care taker. The pool area are used at own risk. Children must be supervised by parents or a care taker. We do not allow alcohol in the swimming pool. Towels and gowns from the rooms are not allowed at pool area. Swimming towels are available at reception. At the Eagle’s Rest you have a variety of accommodation options to suite your needs. Whether you are looking for Honeymoon accommodation or just a quick stay over, we’ve got it. Each Elegant room has its own view, mini-bar (not stocked), air-conditioning, mosquito nets and en-suite bathroom. Each room has its private view of nature. Children: On request only and only 3yrs and under. Rooms can only accommodate two persons. Each room has reserved parking. These rooms are ideal for Honeymooners or the romantic getaway. The Elegant rooms are not self-catering. The Chalets would work perfectly for self-catering guests that would like to enjoy a BBQ with friends and the nature as your backgrounds. Each Chalet have two bedrooms, one bathroom, lounge and kitchen. The kitchen is fully stocked with all the necessary essentials. Each Chalet has a BBQ area and grids can be rented from reception. Chalets would be stocked with natural fire wood every day. The Chalets are child friendly. Children under 12 pays half price and children under 3 are free. There is individual parking in front of each chalet. We have 7 chalets, all near a dry river. We have 10 large campsites. Only the first 3 campsites have power points. Some campsites are located on the river bed, and you can experience wildlife right next to you. The campsites are made up with river sand and camelthorn trees for shade.